Senninger's Medium Flow Pressure-Master Regulator is for mid-range flows of 2 – 20 GPM. Common applications include drip and other low volume irrigation, as well as solid set, center pivot and other mechanical-move systems. 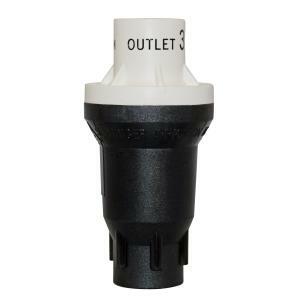 The pressure regulator shall maintain the predetermined operating pressure provided the inlet pressure is at least 5 PSI above the expected outlet pressure, but must not exceed the maximum inlet pressure rating. Always install pressure regulators downstream from all shut-off valves. Be sure to install pressure regulators in the proper direction. The arrow on the upper housing shows the direction of the flow and should always point downstream toward emitters.